Today we return to those dark days of olden yore, and the horrific death of a child. A death which shook Russia to its core. I have this piece by Andrei Sidorchik from the journal Argumenty I Fakty. Full disclosure: I visited Uglich myself just this past summer. I was visiting relatives in Yaroslavl and we took a side day-trip, entirely touristy, to view the sights in Uglich. 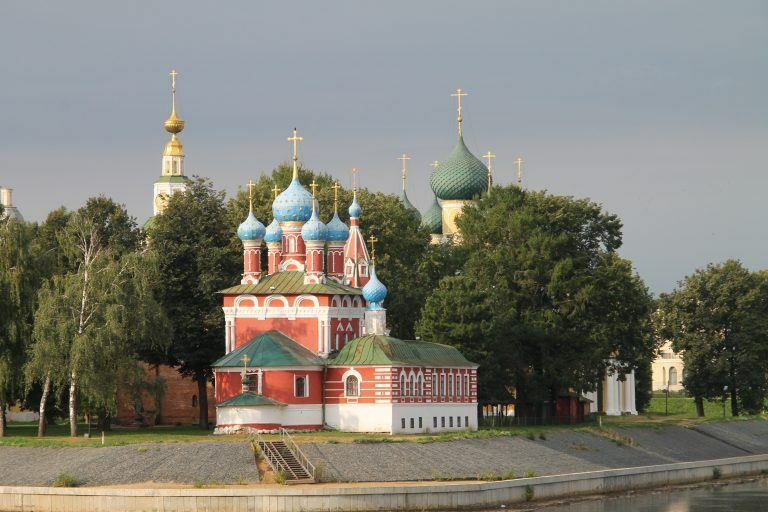 Not unlike the Russian spies tourists Petrov and Boshirov, who went to Salisbury to see the famous cathedral, so too did we go to Uglich to see the famous cathedral. It is called the Church of Saint Dmitry on the Blood. A scary name, and rightfully so, because it was built on the blood of this child-martyr. According to legend, assassins approached the 8-year-old prince and asked to get a better look at his new necklace, of which he was very proud, and constantly playing with. Innocent Dmitry raised his head up to give them a better look at his necklace. Upon which, the assassins cut his throat, and the boy’s blood went spilling onto the ground. And the town of Uglich has never been the same since that fateful day, its residents scarred and traumatized; the town became a pariah-town; and relations between Uglich and Moscow have never been good since then. Moscow became great, and Uglich withered, mute in its resentment. As part of the tour, we saw the tomb where Dmitry’s body had once been laid. (But apparently the body doesn’t exist any more, which is a pity, because DNA analysis could have been done.) The tour guide explained that during the Time of Troubles, there were so many False Dmitries running around (at last count, 11 or 12) that the Uglich priests were assigned to certify that the skeleton in the coffin was the real Dmitry. When they opened the coffin, they found a small body that had never decomposed! Thus proving that Dmitry was a good kid, and Boris Godunov was a no-goodnik. Even more interestingly, I became acquainted with a “political sect” of sorts who reside in Uglich. It’s a sort of underground cell of young people, and I don’t want to give away who they are, since they are opponents of the current government and still hold a multi-century grudge against Moscow. Don’t worry, these people are completely non-violent and harmless. They are more like historical re-enactors. They are religious, they are obsessed with the murder of Tsarevich Dmitry and they continue to relive this tragedy, as if it happened yesterday. And their cult have a rather unique take on Russian history: They worship two main idols: Ivan IV (aka “Ivan the Terrible”) and Joseph Stalin I (aka “Josip the Brute”). In their view, all the bad things started when Ivan’s son Dmitry was murdered; and then things went from bad to worse when Peter the Great turned Russia towards Europe. And then the October Revolution was a horrible catastrophe as well, but fortunately Stalin stepped up to the plate and saved Russia from the Bloody Bolsheviks. In their conspiratorial view of history, Peter the Great was not so great, and in fact he was not even the real Peter! He was a European plant. The cuckoo inserted into the nest of Holy Rus! The real Peter, they say, was short and blonde-haired. He went galavanting off to Europe, already a full-grown man, to receive an education. When he returned to Russia, he was half a meter taller, and his hair had turned dark. Very suspicious! The real Peter, they claim, was captured by Westies and became the Man In the Iron Mask. All quite plausible, I had to admit. I could even accept their love for Ivan and their disdain for Peter; but I made the mistake of engaging in debate and challenging their hero-worship of Stalin. I personally see Stalin as a boorish Kartvelian bully who had the singular talent of being able to lie effortlessly. And also to take the credit for everybody else’s work. To my veiled criticisms of The Great Leader’s political purges and horrific use of torture against his opponents, the leader of this Uglich cell, a young woman, retorted that Stalin was “a good man who was surrounded by bad people. Who ended up poisoning him.” Aha! Okay, that explains everything. 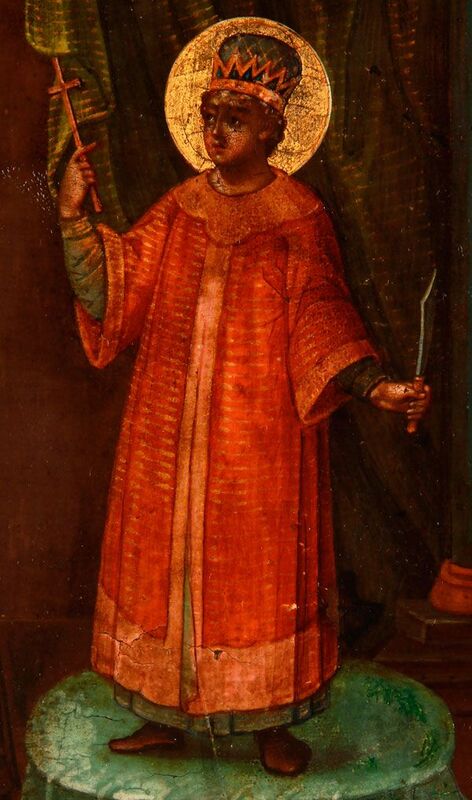 Tsarevich Dmitry Ivanovich was born on 19 October, 1582, the youngest son of Ivan the Terrible. According to Sidorchik, Dmitry, although he carried the title Tsarevich (literally “son of the Caesar”, “son of the Tsar”, i.e., “Prince”), was, strictly speaking, illegitimate, and thus had no real claim to the throne. His mother Maria Nagaya, was Ivan’s sixth, or possibly seventh, wife. Oh, he married her, all right, but the Russian Church never officially recognized this marriage as legitimate. Dmitry was given the same name as Ivan’s first son, Dmitry, who died in infancy. The first Dmitry’s death is also considered problematic, he died while Papa Ivan was out of town. Some say he died of an illness, others say that the baby drowned, either accidentally or on purpose. The second Dmitry, the one we are talking about, outlived his Papa: He was about a year and half old when Papa The Terrible died. Dima’s mom, Maria Nagaya, then entered into, obviously, a highly dangerous situation. Her life was worth a brass farthing, unless she entered a convent. To the throne ascended Ivan’s idiot son from a different wife, Fedor Ivanovich. To clarify: Maria was Fedor’s step-mother, and Baby Dmitry was Fedor’s step-brother. 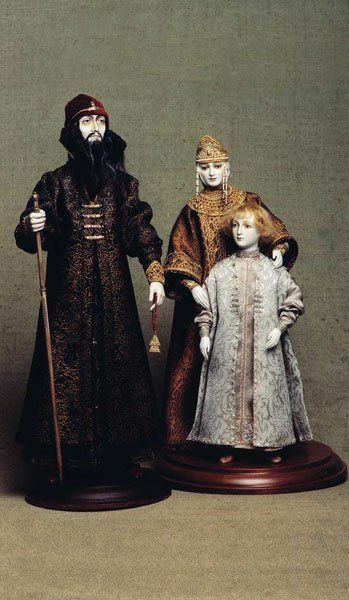 Fedor, who always took the sage advice of Boris Godunov, ordered these two (step-mum and step-brother) to move to Uglich, where he appointed the baby to be head of the regional Uglich Princedom. Next: Baby Dmitry becomes the last of the regional princes. This entry was posted in Russian History, True Crime and tagged Boris Godunov, Dmitry Ivanovich, Ivan the Terrible, Maria Nagaya, Uglich. Bookmark the permalink.